Foodista | Recipes, Cooking Tips, and Food News | Stuffed Eggplant - "Bharwa Baingan"
To roasted gram-flour, add peanut powder,coriander, cumin, turmeric, red chilli powders,amchur, sesame seeds, asafoetida, chopped garlic, coconut and chopped garlic in a bowl. Mix well. Fill the slits in the eggplants with this spice mixture. Keep aside. Do not worry if the mixture is still left. Its always used in the curry. 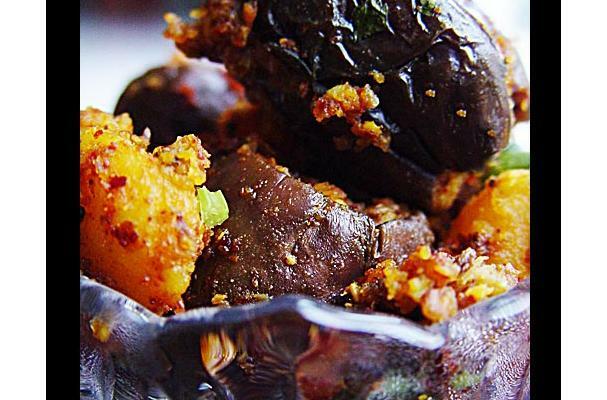 In a pressure cooker, add diced potatoes eggplants and cook for upto 3 whistles. Once cool remove. Heat the oil in a pan (on a medium flame) till hot. Now add the mustard seeds, cumin seeds, asafoetida and cook till spluttering stops. Now add these eggplants and gently stir.Add the left over spice mixture. Cover & cook till the eggplants are done. Stir occasionally but do it gently to avoid knocking the filling out of the eggplants. You will get a dry curry which can be served with your favorite dal (lentil soup) & basmati rice. Enjoy!! Know What U Eat: Eggplant a Brain Food ??? In addition to featuring a host of vitamins and minerals, eggplant also contains important phytonutrients, many which have antioxidant activity. Phytonutrients contained in eggplant include phenolic compounds, such caffeic and chlorogenic acid, and flavonoids, such as nasunin. Research on eggplant has focused on an anthocyanin phytonutrient found in eggplant skin called nasunin. Nasunin is a potent antioxidant and free radical scavenger that has been shown to protect cell membranes from damage. Other health benefits include; type 2 diabetes management, cholesterol lowering and cancer prevention. There's a huge list of ingredients to make this super delicious eggplant..everybody's favorite at my home..but all the efforts worth it. Always choose tender baby eggplants..for the authentic taste of this special recipe. For now Enjoy this stuffed eggplant.